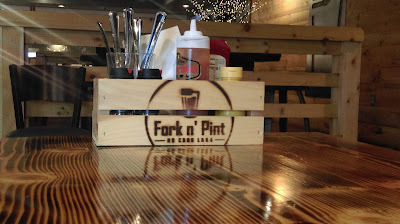 Fork n' Pint in Waterford opened in December 2015 and offers a large menu of comfort food, including burgers, barbecue, fish and chips, poutine fries, and pizzas. Located on Cass Elizabeth Road, the restaurant overlooks Cass Lake's Coles Bay. The interior of the restaurant has ample seating, and its wooden tables and large fireplace give it the cozy feel of a ski lodge. 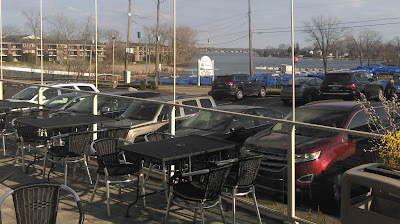 Its large patio overlooking the lake will be a great spot to unwind with good food and drink on a warm summer's night. With only one visit under my belt, I cannot speak for the entire menu, but the food definitely satisfied. My family and I started with the poutine fries as an appetizer. They were good, but I have had better poutine, and I actually found the plain fries that came with my burger to be tastier. It might be obvious from its name, but Fork n' Pint has a large selection of draft and bottled craft beer, including many Michigan brews. They also have a good wine selection, as well as cocktails and spirits, including several from Michigan distilleries. For our main courses, I ordered a ridiculously heavy, but delicious, Muenster Monster burger. This 10-ounce Angus beef burger is topped with grilled house sausage, muenster cheese, haystack onions, coleslaw, and Fork n' Pint's tangy barbecue sauce, and it comes with a side of fries. I had been craving a burger for a few days, and the Muenster Monster delivered. My wife Allison ordered the broccoli and beer cheese soup and a grilled caesar salad. The soup is made with Newcastle Nut Brown Ale and Swiss and roma cheeses. The soup was superb; the beer flavor was subtle and did not overpower the cheeses. As for the salad, Allison and I both love grilled caesar salads and found this one to be quite tasty. Our kids also enjoyed a burger and pizza from the kids menu. 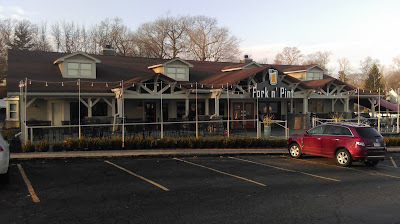 With its satisfying food and relaxing atmosphere, Fork n' Pint was a good experience. We definitely will be visiting again and look forward to warm summer nights dining and watching the boaters on Cass Lake. Cool! I'll make a plan to visit it soon. Nice place. I went there.